Supporting parents who may struggle in providing safe and sensitive caregiving to their infant or toddler is a goal of most home visiting programs. At the University of Washington, a recent study on home visiting shows that a brief 10-week program not only supports sensitive caregiving but also impacts children at a biological level. This study, led by Monica Oxford, Ph.D., director of the Barnard Center for Infant Mental Health and Development, in partnership with researchers at the University of California, Davis consists of two parts. The study first assessed the effectiveness of a parent home visiting program. 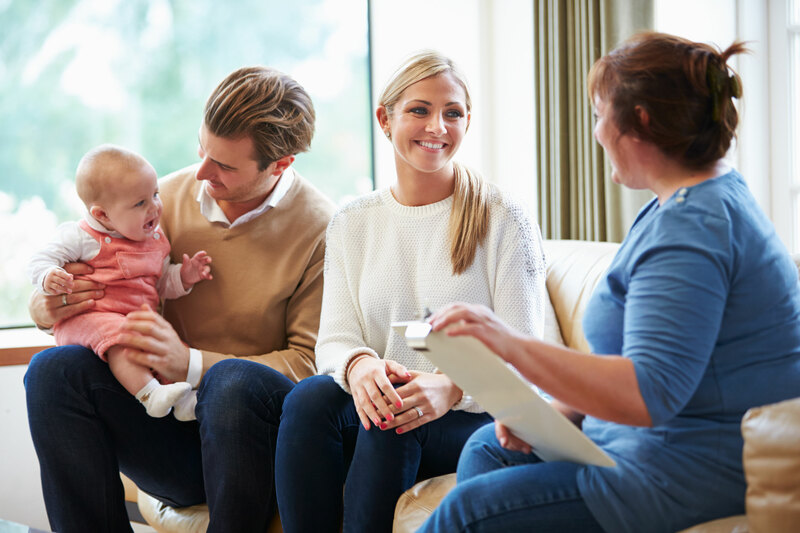 Out of 247 families referred to Child Protective Services for maltreatment, a portion of the group was randomly assigned to receive the Promoting First Relationships® home visiting program. Another group received the standard referrals and resources, to serve as a control group. Results of the study showed that the families that received the Promoting First Relationships® program had fewer foster care placements and increased caregiver sensitivity of their toddlers’ social and emotional needs. The second part of the study compared the impact of the intervention on children’s physiology at the end of the trial at six months post intervention. The study measured changes in heart rate to assess the parasympathetic regulation as the children performed challenging or slightly stressful activities like completing a puzzle or petting a toy spider that jumped unexpectedly. Looking at 29 families who received the Promoting First Relationships® program, the children had milder reactions. They were alert and receptive but not overly reactive to the mild stressors. The control group, children from 30 families who received resource and referral had a more dramatic parasympathetic response, leading to the tendency for a more distressed or withdrawn reaction. Other studies have shown similar responses in teens and adults who experienced maltreatment as children. It’s often not easy to assess the impacts of a service on a given population. Linking a parenting intervention with a physical response is a new way to do this. “It’s groundbreaking to show that a brief home visiting intervention can impact toddlers’ parasympathetic regulation during challenging tasks,” says Oxford. According to study collaborator Paul Hastings, professor in the UC Davis Department of Psychology and Center for Mind and Brain, it’s significant because children who experience maltreatment are at a higher risk for depression or other mental health issues as adults. Hastings also notes that the connection between parenting behavior and the physiological regulation of their young children is another marker of internal strength and resilience that can impact an individual’s future coping abilities. Studies like this offer a two-fold benefit: it’s an ethical way to study resiliency and those involved can practically apply the results. That’s why the Barnard Center has conducted several studies on home visiting. “Nurses do home visiting. Social workers do home visiting. Home visiting is a venue in which providers deliver intervention and prevention services in the maternal-child health field,” said Oxford. Additional studies at the center are evaluating home visiting within a variety of populations including children who have recently been reunited with their birth parent after a foster care separation, Spanish-speaking mothers with mental health needs, and within American Indian communities. What’s next? Oxford wants to dig deeper and examine how exposure to adversity during the first three years of life impacts lifelong health outcomes and how home visiting that improves parental sensitivity might provide a protective buffer for young children. Specifically, at the microbiological level: telomere “helmets” at the end of DNA strands wear down with exposure to adversity. She hopes to secure funding to study how the sensitivity of a caregiver (and interventions to support sensitivity) may decrease the amount of wear-and-tear at the cellular level, increasing the long-term protection to individuals. Big picture, that would be another pioneering step forward in serving families and supporting infant mental health and development.